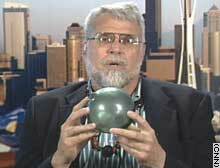 Curtis Ebbesmeyer holds up a glass float that washed up on a Pacific Northwest beach recently. Such fishing net floats might have been lost 20-30 years ago, he said. (CNN) -- When an oceanic garbage patch the size of Texas dumps some of its treasures along the West Coast this summer, an oceanographer obsessed with junk and thousands of amateur beachcombers will be ready. Curtis Ebbesmeyer, a Seattle, Washington-based oceanographer dubbed "the big Kahuna of beachcombers," works with about 1000 beachcombers around the world to collect meticulous data on finds including aircraft parts, LEGO toys and medical waste. "I go out on the beach, too, but those beachcombers are the eyes and ears of the ocean," he said. Ebbesmeyer says a giant marine trash heap is centered between Oregon and Hawaii. Named the North Pacific Subtropical Gyre, it spins continually and is constantly supplied with fresh cargo spills by currents coming from Japan. This year, stronger and longer southwesterly winds will move some of that patch to the West Coast of the United States, he said, which means beachcombers in the Pacific Northwest could find World War II medical supplies, sandals or even messages in bottles. '"We have the event of the century going on," Ebbesmeyer said. "The Pacific currents are re-arranging themselves, and we have the jewels of the Pacific, these glass fishing floats, that are already starting to wash up." Although oil spills might look like the most damaging thing humans can do to oceans, artificial objects might be worse, Ebbesmeyer said. "You have oil, which is basically biodegradable," he said. "Bacteria will eventually eat it, and it will go away. Whereas plastic, it disintegrates, but the plastic molecules never go away. What I'm afraid of is they're getting into the food chain and coming back up into the food we eat." Ebbesmeyer used to watch currents by tracking buoys and markers dropped at sea. But he had a eureka moment during a conversation with his mother. "She always asked me what I did as an oceanographer, and I said it's really hard to explain," he said. "Then there were reports of all these Nike shoes washing up onshore in the early '90s, and she said, 'Well isn't that what you do?'" 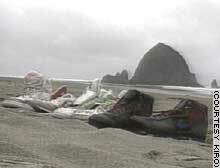 Nike shoes washed up on Pacific Northwest beaches after they were lost from a container ship in May 1990. After that conversation, he started the detective work of tracking cargo spills from ships around the world. Details of the great Nike spill of 1990 put his name and his research on the map. The ship Hansa Carrier was hit by a strong storm in May 1990, sending 21 shipping containers overboard. Five of those held Nike sneakers and work boots -- about 80,000 in all -- with unique serial numbers. With the word out that he was tracking where the shoes came ashore, he hooked up with beachcombers in Washington and Oregon, who were organizing swap meets to match lefts and rights of the same size to wear and sell. Toys and sporting equipment created two other memorable cargo spills. In 1992, tens of thousands of bathtub toys (blue turtles, yellow ducks, red beavers and green frogs) went overboard in the mid-Pacific. And in 1994, the Hyundai Seattle gave up 34,000 hockey gloves, chest protectors and shin guards. Ebbesmeyer has worked with marine scientist Charles Moore, who studies the ocean from his research vessel, Alguita. The research helped Moore find that the ratio of plastic to plankton (the tiny plants and animals eaten by many ocean dwellers) in the North Pacific Subtropical Gyre is about six to one -- a sort of "thickening ocean soup of plastic dust," he said. That plastic can harm ocean life from the very start of the food chain, he added. Moore and Ebbesmeyer say they hope their combined research and public-awareness campaign will spur development of agricultural plastics which won't be as toxic as petroleum-based plastics. "The plastic on your sandwich really doesn't have to be made to last 50 years," Moore said.